Despite everyone’s best efforts, it’s very common for teeth to become cracked, broken, decayed, or even go missing altogether, leaving a smile looking and feeling far from its best. Fortunately for the people of Jacksonville, these minor problems don’t have to spell trouble for their appearance and oral health thanks to Dr. Jignesh Patel. Using the latest techniques and most advanced materials, he’s able to create lifelike crowns and bridges that can make any dental issue seemingly disappear. Read on below to learn how your family dentist in Jacksonville can fully restore your smile! A dental crown is one of the most commonly used restorations in all of dentistry. It is a tooth-shaped “cap” that simply fits over the top of a damaged tooth in order to protect it while also bringing back its lost strength, structure, and appearance. 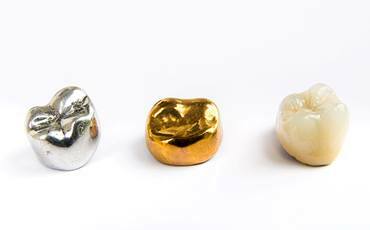 Every single crown provided by Dr. Patel is custom-made for each patient so that it blends seamlessly into their smile. It typically takes two appointments to have one designed, manufactured, and placed. At the first one, Dr. Patel gently removes any damaged or decayed portions of the tooth, shapes it to fit under the crown, and then he takes a dental impression. This is then sent to a dental lab to fabricate the final restoration, which is cemented in place at a follow-up visit a week or so later. To help our patients enjoy the most natural appearance possible, Dr. Patel often uses 100% porcelain crowns that can be shaped and shaded to replicate real enamel in every way. 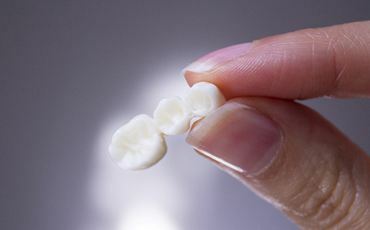 While crowns are intended to treat teeth that are still present in the gum line, bridges are instead designed to help fill in the gaps left by one or more consecutive missing teeth. At Dental Center of Jacksonville, we actually offer two types of bridges. For one, dental crowns are placed on the teeth surrounding the missing one, and these are used to support a prosthetic tooth to close the space. Or, if a patient doesn’t have enough healthy dental structure for this, a bridge can also be supported using dental implants. With this kind of restoration, we’re able to help the smile look like normal again as well as provide renewed stability for the bite and prevent the remaining teeth from shifting into the open space (which happens often after tooth loss). If you’re currently dealing with a smile that is hurting or incomplete, know that we’re ready to provide the personalized solution you need. Dr. Patel has provided countless crowns and bridges over the course of his career, and as a result, he's also helped countless people reclaim their complete smiles. To learn more about your restorative options here at Dental Center of Jacksonville, or to schedule an appointment, give us a call today.